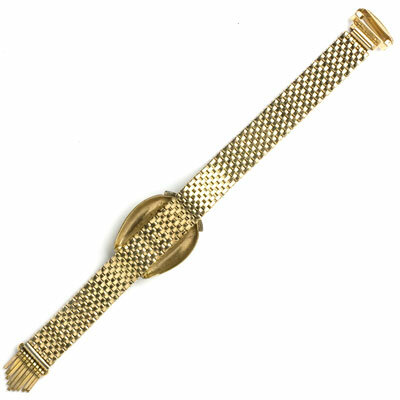 This 1940s bracelet by Kreisler features the flexible gold-tone links and tasseled end that were very popular Retro Modern design elements. 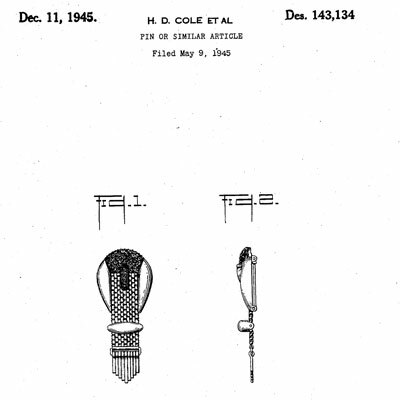 The company referred to the pattern of these woven links as basket-weave and designed several bracelets, necklaces, and brooches with this link pattern. 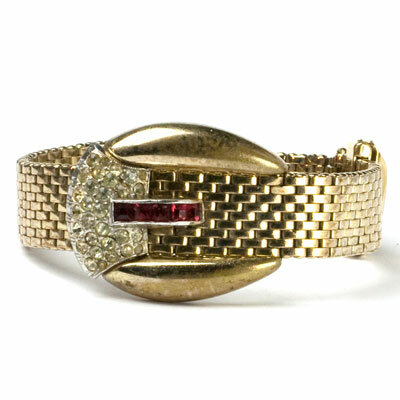 A decorative buckle adorned with diamanté and ruby-glass stones adds elegance to the design of this bracelet. The matching necklace and brooch were advertised in the March 15, 1946 issue of Vogue. 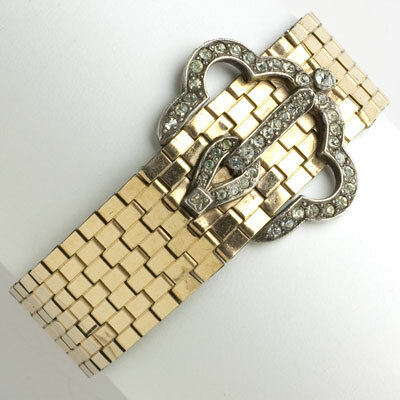 Although this bracelet is no longer available, scroll down to see a similar piece you might like. 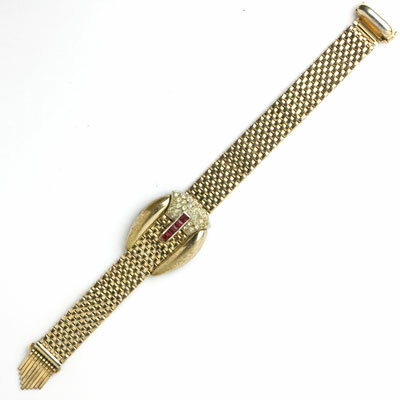 This vintage gold bracelet of flexible links in the brickwork pattern is adorned with a pavé fixed-buckle. 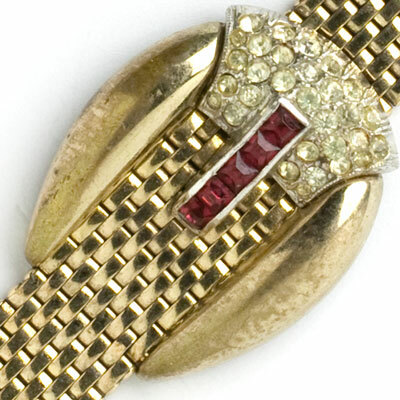 This elegant Retro Modern piece by Dorsons has a fold-over clasp. 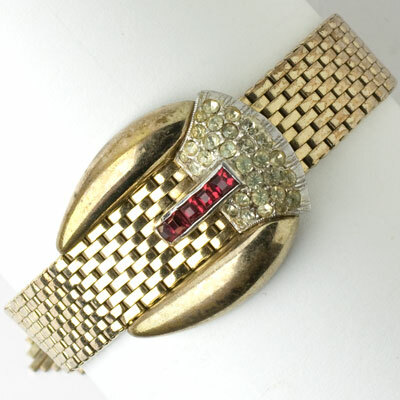 Gold-tone costume jewelry of the 1940s with intact finishes is really hard to find. This piece is well preserved because it is gold-filled, rather than just plated. A Dorson’s ad in Vogue for other designs made with the same materials said their stones were hand-set. 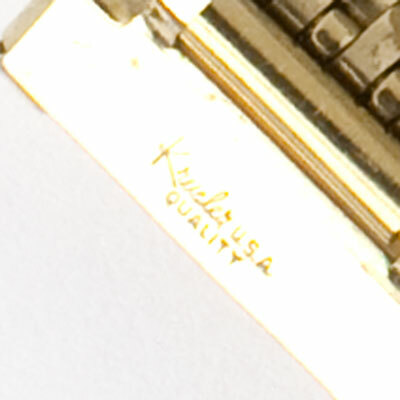 Please note that dark areas in the photos are reflections of the camera.